Dennis Kucinich was raised dirt poor, with the family often forced to move when landlords discovered how many Kuchinches there were -- he is the eldest of seven children. He was elected to the City Council in Cleveland in 1969, when he was 23, and at 31 he became the youngest person ever elected mayor of a major American city when he took charge of Cleveland. His two-year term as Mayor was controversial almost from the start. He appointed a 19-year-old to a key city position, a 24-year-old with less than a year's experience as a stockbroker was named the city's finance director, and almost half his key appointments were black. He rejected a $41-million federal grant to begin construction of a downtown "people mover". He publicly feuded with the city's popular Police Chief, and fired him live on TV for insubordination. The Police Department later went on strike, protesting proposed budget cuts. He fought against allowing Republic Steel to construct a new ore dock on a city-owned pier, and the company ended up relocating to nearby Lorain, Ohio. The city had been in financial ruins when Kucinich took office, as the previous administration had misspent tens of millions of dollars of bond funds. Ohio's largest bank, then called Cleveland Trust and now known as Ameritrust, threatened to yank the city's line of credit unless Kucinich sold the city-owned electric system, Cleveland Public Power (CCP), then called Municipal Light, to CCP's competitor, Cleveland Electric Illuminating (CEI). He refused to sell the utility, forcing the city into default. Kucinich narrowly survived a recall election, then lost when he ran for a second term as Mayor. Unemployed, Former Mayor Kucinich moved to Los Angeles, where he lived near and frequently wandered MacArthur Park, playing the Richard Harris pop song "MacArthur Park" in his head. "I was thinking of that song and thinking of the lyrics where they talk about 'Someone left the cake out in the rain. It took so long to make it.' And it goes on, raising the question of whether I'll ever have that recipe again." Meanwhile, after it was too late to matter politically, the Cleveland Plain Dealer exposed that Ameritrust had been heavily invested in CCP's competitor, CEI, and stood to profit greatly if Kucinich had sold the utility. It was also revealed that CEI had committed numerous violations of federal antitrust law as it attempted to drive Municipal Light out of business. Twenty years after the controversy faded, the Cleveland City Council passed a special resolution thanking Kucinich for saving Municipal Light. It is estimated that having a city-owned utility saves Cleveland residents about $20-million every year. Returning to Cleveland, he had success in business with Kucinich Communications, a company that produces industrial videos and brokers media time for its clients. He was elected to the state Senate in 1994, where he was instrumental in blocking a planned nuclear waste dump in the state. He was elected to the US Congress in 1996, and has been re-elected every two years since. 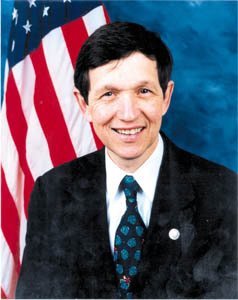 As a Congressman, Kucinich opposed NAFTA and the PATRIOT Act, and fought against cuts in Social Security. He proposed a national health care system, nuclear disarmament, tax relief for working-class families, making pre-school available for all children, and establishment of a Department of Peace to explore alternatives to war. He was an outspoken opponent of the 2003 invasion and occupation of Iraq, arguing that there was no proof Saddam Hussein had any weapons of mass destruction, and that a US-led war would have a destabilizing effect in the Middle East. In his first few years in Congress Kucinich was ranked among the Democrats most hostile to abortion rights, but after a public scolding by his friend Studs Terkel in the late 1990s, Kucinich consistently voted against restricting abortion rights. He sought the Democratic Presidential nomination in 2004 and 2008, but was considered a long shot and given little media coverage. He won no primaries, but as the only unmarried candidate he was invited onto The Tonight Show, where he played a mock round of The Dating Game and won an evening with actress Jennifer Tilly. In 2005 he met and married Elizabeth Harper, a former volunteer at one of Mother Teresa's orphanages in India. His district was redrawn in 2011, effectively merged with Rep Marcy Kaptur's 9th District, and she defeated Kucinich in the 2012 Democratic Party primary.